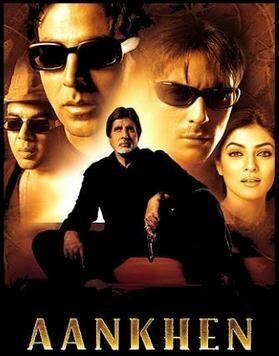 Aankhen (Hindi: आँखें, translation: Eyes) is a 2002 Indian heist thriller drama film directed by Vipul Amrutlal Shah, starring Amitabh Bachchan, Akshay Kumar, Arjun Rampal, Sushmita Sen and Paresh Rawal in the lead roles. Aditya Pancholi is featured in an important supporting role. The film is an adaptation of Shah's own Gujarati play Andhalo Pato (Blindman's Buff). The film tells the story of Vijay Singh Rajput (Bachchan) a hard-working but temperamental man, who has spent all his life working for one bank and even achieving them International recognition. When Vijay loses his mind and goes on a violent rampage beating up another employee, he is subsequently fired. He decides to take vengeance by organising a full on heist, and having the same bank robbed by three blind men, as no one will suspect them. 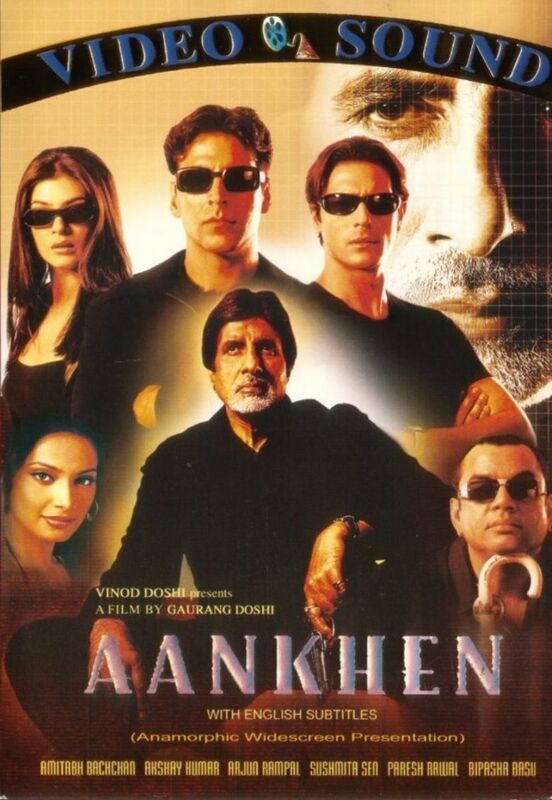 Aankhen had its worldwide premiere in Malaysia at the 3rd IIFA Awards ceremony on 5 April 2002. 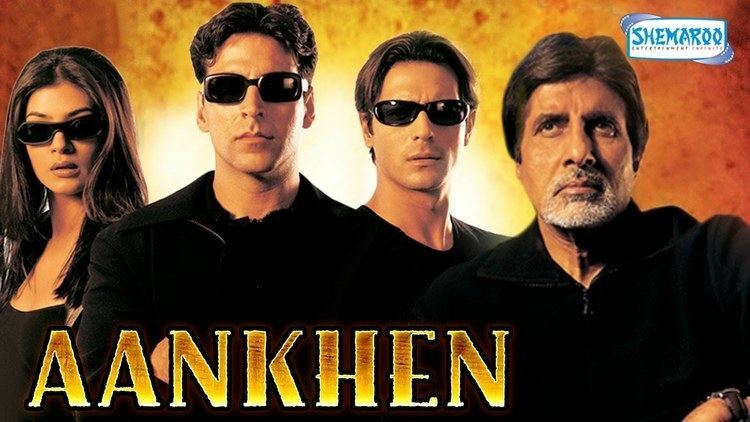 Upon release Aankhen received acclaim from critics and cinema-goers alike, for its unusual storyline, well executed direction and acting, with Bachchan and Akshay Kumar drawing maximum accolades for their performances. The film was nominated in several award categories in 2002/03, although it didn't win any. Obsessive and temperamental bank manager Vijay Singh Rajput (Amitabh Bachchan) loses his job for badly beating up a bank clerk who tried to embezzle money. Angered at losing his job he plots revenge on the bank by intending to stage a heist. He employs three blind men – Vishwas (Akshay Kumar), a blind person who has the power of the sixth sense, Ilyaas (Paresh Rawal) and Arjun (Arjun Rampal) — when, after passing by school for the blind, he understands that blind people can be trained to do things like sighted people. He blackmails and enlists the help of Neha (Sushmita Sen) who is a teacher at the school to train the trio to do the seemingly impossible heist. He chose blind people because they, as thieves, would never be suspected as no one would believe blind people can rob a bank. The bank robbery is successful, with the jewels safely captured by the three. However, in the process of robbing the bank, Ilyaas's face is exposed, captured in footage and prompting citywide posters with his face. Meanwhile, Mr. Rajput anxiously tries to extort information from Vishwas and Arjun regarding the jewels and their location. Unable to answer, as they did not collect the items, they try to defer the answer by changing subjects. Ultimately, it is revealed that Ilyaas is the one with complete knowledge of the box's belongings. Meanwhile, tensions rise between Rajput and Neha; the latter resists the abusive nature of Rajput and his obnoxious harassing of Vishwas and Arjun. Arjun confesses his love to Neha, who reveals that she is associated in the plot only for the well-being of her younger brother, Rahul, who has been kidnapped by Rajput. In a furious attempt, the police try to locate Ilyaas. Ilyaas lands up at Rajput's place after getting drunk. Rajput tries several ways to force Ilyaas into revealing the location of the box. Unable to generate an answer, he slams Ilyaas, who falls on the ground and injures his eyes, causing bleeding. Even in this scenario, Rajput tries to get the information, but Vishwas and Arjun resist and claim that they will reveal the location if Ilyaas is treated by paramedics. Rajput send them to get Dr. Siddiqui. Vishwas senses that Ilyaas is in danger and Arjun and Vishwas double back to the training center to save him. Rajput starts to harass Ilyaas by tickling him to force him to reveal the answer. In the action, Ilyaas falls of the balcony and dies. Unable to bear the shock of the death, Neha pulls a gun on Rajput and threatens to reveal everything to the police if he does not leave her and the other two alone. Rajput notifies Neha that all these acts were done under her training, and he is spotless. Unable to bear this fact, Neha shoots herself, just as Vishwas and Arjun return after hearing loud screams. Both men gang up on Rajput and try to attack him. Once Rajput realises that the men are ignorant about the jewels, he starts shooting them. The police arrive, and confusion ensues. Vishwas and Arjun come out and claim that Rajput is abusing them while he claims that there is a big conspiracy involving the two men, Neha and Ilyaas. Unable to believe that blind men can ransack a bank and amidst Rajput's impassioned defence, the police start getting suspicious. In the heat of defending himself, Rajput reveals that he had sent over Ilyaas, thus confessing his crime. In the end Rajput is locked away. Vishwas and Arjun decide to take care of Rahul and ultimately find the jewels – they were hidden in Ilyaas' musical instrument. In an alternate ending for overseas viewers Rajput bribes the cop (Aditya Pancholi) and is set free. Vishwas and Arjun are sitting in a train (waiting for it to depart) and Rajput is standing on the platform with a smile on his face. 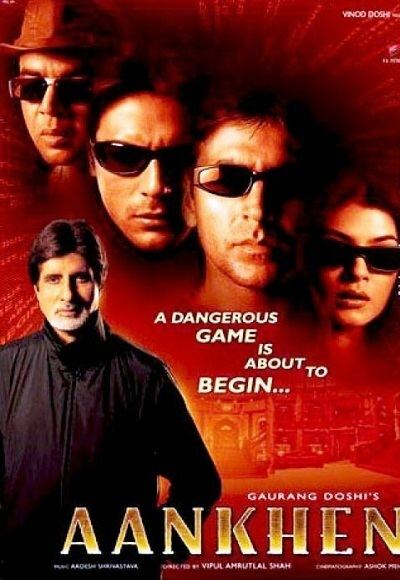 He then warns them that "A dangerous game is about to begin", after which Vishwas and Arjun both draw their guns, and the film ends. Kashmira Shah in a special appearance in song "Chalka Chalka"
The film's working title was "All The Best" but was later changed for numerology reasons and to better suit Indian audiences. Originally Raveena Tandon was cast for the role of Neha, but she was unexpectedly dropped and replaced by Sushmita Sen. Sen in turn made a lot of preparations for her role as a teacher to the blind. She visited schools for the blind and interacted with the students for a more-realistic feel to her role. 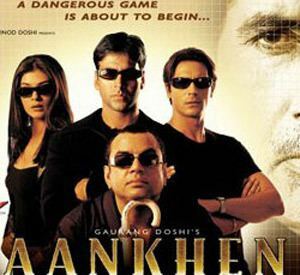 Aankhen opened well at the Indian box office. The film made Rs 471.9 million net altogether and was declared a "Hit" at the end of its theatrical run thus making it the third highest grosser of 2002. It was also the second-highest-grossing Bollywood film of 2002. The film was also a success in South Africa, opening to packed houses and grossing $14,600 on the weekend, despite a limited release. The soundtrack was composed by Aadesh Shrivastav and Jatin-Lalit. Lyrics were penned by Prasoon Joshi, Praveen Bharadwaj and Nitin Raikwar. 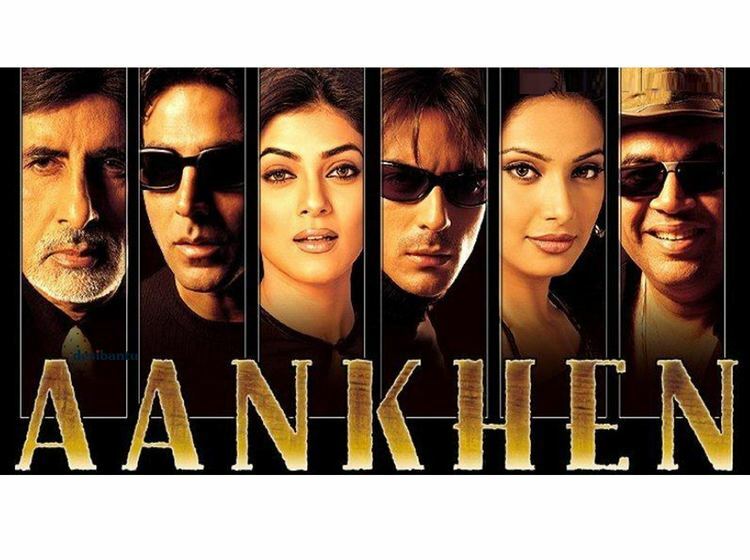 Aankhen broiled into controversy when producer Doshi did not give the director Shah any credit on the film's DVD. The fallout began between the two on the sets, after a number of creative differences, which led to allegations of plagiarism and counter-allegations. The DVD's front cover had Doshi's name on it and the back had the director's name as Vipul Doshi instead of Vipul Shah. Shah took legal action against Doshi, who refused to take responsibility for the director’s missing credit. Between 2004/05, two bank robberies occurred on Mira Road in Maharashtra by a man named Feroz Sheikh and several accomplices, who were said to have been inspired by the film. The robbers took several lakh rupees (100,000), and planned to use it to start a business. The culprits were eventually nabbed but not all the money was recovered. A computer game based on film was created for promotional purposes in a tie in with IndiaFM and Hungama.com (Now collectively known as Bollywood Hungama). It was launched at the IIFA press conference on 14 March 2002. 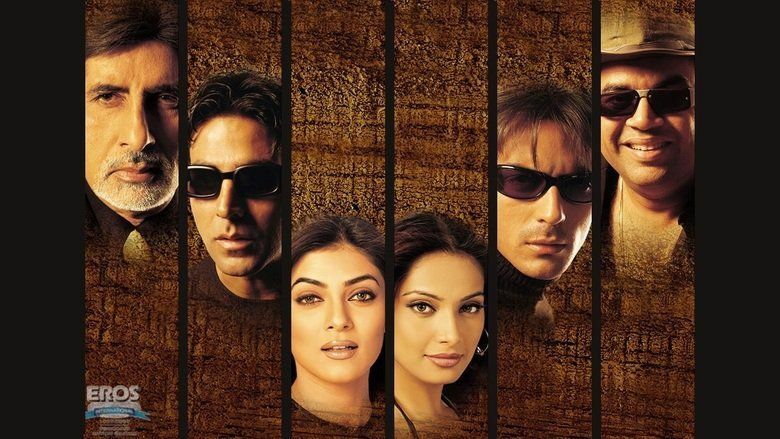 The sequel was first announced in 2006 and has been in production since shortly after the release on Aankhen. The director Shah was dropped due to differences with producer Doshi, and directing duties will be taken over by Sachin. Pre-production work has been wrapped up, but shooting is yet to begin as Bachchan has been unable to give dates due to his health declining. However, on 19 March 2016 in an interview with Anees Bazmee about his film "No Entry Mein Entry", Anees stated that he is currently working on a script for "Aankhen 2".